Transit Trailblazers at the L.A. County Arboretum. Metro’s On the Move Riders Club is a peer-to-peer travel training program designed to educate older adults on the basics of riding public transportation. In the process of learning to ride, club participants travel to destinations throughout L.A. County. They are led by volunteers called Travel Buddies, older adults who are already experts at navigating bus and rail transit. There are currently forty-six Travel Buddies who lead 26 clubs throughout the County. Bobbi Leslie is a Travel Buddy for the Burbank Joslyn Adult Center and leads Metro outings for their On the Move Riders Club. 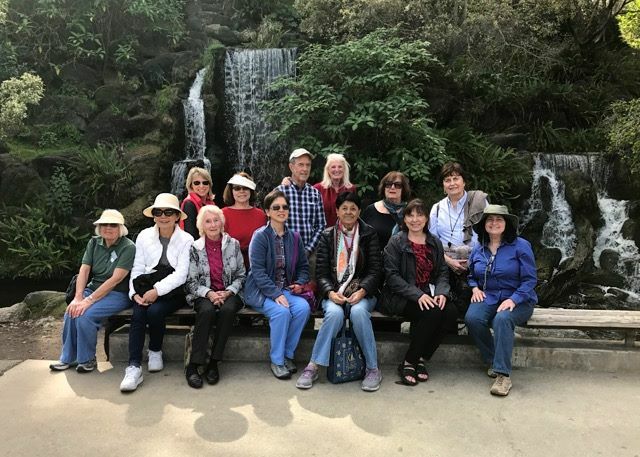 Their members are known as the Transit Trailblazers, and recently they visited the L.A. County Arboretum & Botanical Gardens via the Gold Line. The Transit Trailblazers took a docent led tour at the Arboretum and spotted rabbits, Canadian geese, turtles, and of course, peacocks! The ended the tour at Peacock Café, where they were able to get lunch before heading home. Travel Buddy Bobbi Leslie exploring the flora at the Arboretum. To get to the Arboretum, take the Gold Line to Arcadia Station. From there, transfer to the Arcadia Transit Green Line Bus. Riders who are 62 and older are eligible for discounted Metro fares if using a Senior TAP card. Click here for information on how to apply. For more information on how to start an On the Move Riders club, call 213.922.2299 or email OntheMove@metro.net.